Smokin on the River BBQ Festival June 14th and 15th | Joe Hayden Real Estate Team - Your Real Estate Experts! Its Father’s Day Weekend, so why not celebrate it with a good, old-fashioned BBQ? 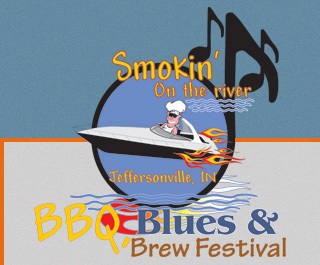 The 5th Annual Smokin’ on the River, BBQ, Blues and Brew Festival is coming back to the banks of the Ohio on Friday, June 14th and Saturday, June 15th. Just follow your nose as the alluring scents of spices, smoked flavoring and cooking meat waft across the water to lead families to some of the best home cooked barbecue they’ve ever had. A short drive or walk across the river to the corner of Spring Street and Riverside Drive in Jeffersonville will put you in the heart of the festivities. The BBQ tasting tent is open from 4:00 p.m. until 9:00 p.m. for food and brews, with brew tasting extended until 11:00 p.m. on Friday, June 14th. On Saturday, brew tasting starts early from Noon until 4:00 p.m. and then it's time for barbecue until 9:00 p.m., with hours extended until 11:00 p.m. for brew lovers. This is the 2nd largest BBQ festival in the ENTIRE state of Indiana, and it is part of a national contest sanctioned by the Kansas City BBQ Society, qualifying for the Jack and American Royal Payouts available to 10 lucky winners. So, be prepared for literally the best of the best barbecue our neighbors across the bridge have to offer. The music will take place on the Jeffersonville Riverstage on East Riverside Drive. This is a fun for the whole family event with great food, good beer and plenty of fun and games.